'The Great Tornado Doldrums' | Watts Up With That? Putting information together from various sources, Sebastian Lüning and Fritz Vahrenholt have written a short analysis of tornado activity in the USA. Despite what one hears from the media, the two German scientists describe recent tornado activity as being in “great doldrums”. In May 2013, there was a series of severe tornadoes that caused horrible damage. The media reported profusely on these events (see our blog article “Violent Tornado Double Strike in May 2013 in Oklahoma: The History of Tornado Alley Since 1950“). How should we perceive these storms? Has tornado activity perhaps increased over the recent years, as some commentators have assumed from their gut feeling? If yes, could climate change perhaps have something to do with it? Rather than relying on the suspicions and interpretations from third parties, it is worthwhile to have a closer look at real data so that a scientific basis can be established for the purpose of discussion. We therefore first take a look at the tornado frequency of the last 8 years (Fig. 1). The steepest increase in each of the curves takes place in April and May, which is the main tornado season. Surprisingly, despite the prominent storms, the year 2013 (black curve) is in last place, and is comparable only with the year 2005 (green curve), which also saw relatively few tornadoes. The years 2008 and 2011 saw the most tornadoes. Figure 1: Tornado frequency of the last 8 years, cumulative for each individual year. Source: NOAA Storm Prediction Center, 19 June 2013. And how does this compare to the long-term? Figure 2 depicts the statistically evaluated tornado frequencies since 1954. Also here the year 2013 ranks near the bottom. More than three quarters of all years saw more tornado activity than 2013. Figure 2: Long-term tornado frequencies in the USA since 1954. Besides the strongest and weakest tornado years, also the limit range for the upper and lower 25%, as well as the mean value (50%) are shown. Source: NOAA Storm Prediction Center. And how was last year? Also in 2012 tornadoes were relatively rare, as no year saw fewer tornadoes than 2012 since tornado recording began in 1954. 2012 was the absolute low-point of the officially recorded tornado development of the past 60 years. The lilac-colored curve in Figure 2 represents the year 2012, which is not that far off from the current 2013 year (black). Next let’s take a look at a bar chart of the last 40 years (Figure 3). Also here we can observe that tornado frequency has a downward tendency rather than an upward one. Figure 3: Tornado frequency development since 1970 for the more powerful EF2 and higher category tornadoes (upper chart) as well as EF3 to EF5 (lower diagram). Source: WUWT. Dr. Sebastian Lüning is a geologist and Prof. Fritz Vahrenholt is a chemist. Together they authored the climate science critical book “Die kalte Sonne”, which reached No. 1 on the Spiegel bestseller list for non-fiction in 2012. 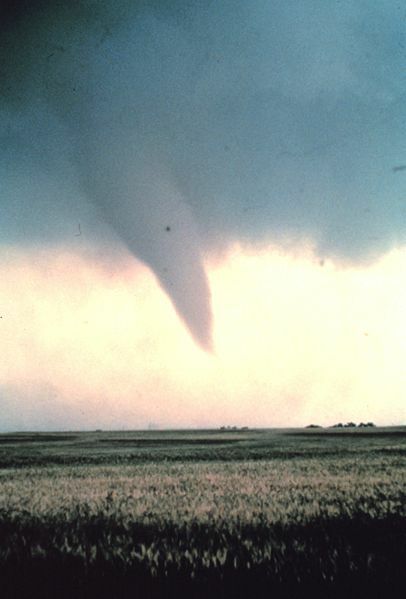 According to the charts showing frequency of tornados, it appears that tornados may be more apt to occur with more frequency during times of cooling as per the 1970s. Frankly, I do not understand how we have come to accept the term “climate” and the implications of that term without any real controversy. IMO, climate is not an especially useful concept, depending entirely on essentially random outputs of a chaotic planetary heat engine. One period’s climate is entirely a function of the particular arbitrary start and end date and the occurrence of random behaviors that happen to fall within that period, which will essentially never be exactly the same as any other period.past, present or future. So, therefore any particular future 24 hour period will have 1 divided by period length probability of setting some particular record for that climate period. So what use is an average (climate) if the probability of being outside the probability range is entirely a function of the period length ? In short, climate is essentially a grab-sample concept. Climate Change OTOH is completely “oxymoronic”. It will always change depending on how it is defined. Another crack in the Berlin wall of climate alarmism. WUWT is the best source of information to counter the warmists one cannot avoid that exists. Since tornado spawning on the plain is essentially a product of the interaction northern cold masses of air and warm, wet southern air masses during the spring and late fall, the only effect that I think “climate change” could have (if there is such a thing) would be to shift the latitude at which most tornadoes happen. If it was colder it would seem this interaction would take place in a more southerly direction, and warmer, in more northerly parts of the band. And yet even this may not be noticeable, since the seasonal temperature variations (early June is always much warmer than late much) are going to overwhelm any climate induced effects. Probably easier to just say that Tornado’s are going to happen, and when they happen, they happen. Try to get out of the way, and if you live in tornado alley, invest in a storm shelter, for god’s sake! almost all of that 1/2 degree is from number fudging…. I see a lot of computers with the fake antivirus/fake FBI warning scams. They have been going on for years. Every single one attempts to scare you so that you will not think, just act. If these scammers weren’t making money, they wouldn’t keep making new variants every day. Is this any different than someone telling you that your lifestyle is causing a climate catastrophe but it can be fixed just by surrendering your money? My rule for figuring out a scam is if THEY tell you about a problem you didn’t know about until they told you and THEY conveniently have the fix for your problem that you didn’t know about. Example: Someone comes to your door and says you have a roof problem but don’t worry, they can fix it for a small fee. Another example: Someone tells you tornadoes are getting worse but don’t worry, if you do what they say everything will work out. Most of the charts you see have start-dates that are too recent to fully embrace the sixty year cycle (roughly) of both the PDO and the AMO. I should think we would start to see patterns that are similar (though not identical) to the 1950’s, which would mean we are at a low point and heading back towards greater numbers of tornadoes. If the Global Warming hoop-la doesn’t crash and burn over the next few years, then the increase in the number of tornadoes will give Alarmists and excuse to froth and tax, whereupon we will need to point out the spike in tornado numbers that occurred in the past. There are vast flat spaces in Central Asia and Western Siberia; and yet, reports of tornadoes in these regions are very few, and tornadoes there, if they ever occur, are much less powerful than in the U.S. I remember that the story of Dorothy and her Kansas house being lifted away by tornado, while popular in Russian translation by Volkov (who has written several Russian sequels about the Land of Oz of his own, never mind the intellectual property rights), always has been perceived by Russians as total fiction: nobody in Russia has ever seen a vortex of air capable to lift even the smallest of houses. It seems that Eastern Plains of the U.S. have some special conditions favorable to this phenomenon. I consider climate to be the framework within which weather happens. It frames the kind of weather that can be expected to happen and is probably impossible to predict, looking forward. When looking back it is the frame within which known weather has happened as identified by direct and proxy evidence. Pay attention to error bars when discussing absolutes. So, therefore any particular future 24 hour period will have 1 divided by period length probability of setting some particular record for that climate period. agreed. the longer you sit on the beach, the greater the chance of seeing a wave bigger than all the rest. Yet the waves are not getting bigger. What is getting bigger is the length of time you are watching. The same with all weather extremes, be it temperature, storms, whatever. the longer you keep looking, the more likely you are to see something that breaks the records. even if there is no change in the climate. thus, climate change isn’t simply a result of changes in climate, it also changes depending upon how long you, the observer have been watching. The longer you watch, the more extreme events you will see, without the slightest change in climate. No relation as they put it seems to be wrong. The relation is instead opposite of what we normally are told. GW means less tonadoes, period. OT but the picture is neat. If you zoom in you can see Willis fishing. 🙂 The article on Yahoo (Nasa hyper linked) suggests global warming is the cause. The same ridge of high pressure that cleared Alaska’s skies also brought stifling temperatures to many areas accustomed to chilly June days. Talkeetna, a town about 100 miles north of Anchorage, saw temperatures reach 96°F (36°C) on June 17. Other towns in southern Alaska set all-time record highs, including Cordova, Valez, and Seward. The high temperatures also helped fuel wildfires and hastened the breakup of sea ice in the Chukchi Sea. If global temperatures begin to cool after this 17 year long global warming Hiatus, will there be an up tick in tornadoes? and if there will be, because there has recently been an attempt to link all current weather events to anthropogenic global weather weirding climate change, will the cooler global temperatures be even acknowledged? Does ‘global warming’ cause tornadoes? No. Will climate change influence tornado occurrence? The answer is No, climate change does not influence a climate change. long term recorded trends in weather variability are not an influence on the long term recorded trends in weather variability. Either Germans aren’t much into non-fiction or German citizens are much farther ahead on the reality curve than influential climate scientists. Scientists tend to devalue common sense which is largely what the world is about in the affairs of humankind. I myself tend to think that space-time and relativity are actually really common sense anyway. Is it possible to link the tornado frequency to the PDO? Yet Al Gore complains that scientists won’t allow him to tell fairy tales about tornadoes linked to climate. Even Warmist scientists find this claim to be clearly false. A good thing to happen is less tornadoes. Occasional weak cool-season links may occur between the phase strength of the El Niño Southern Oscillation (ENSO phase strength) and EF1 to EF5 tornado reports for bi-monthly periods from 1950 through 2010. And how was last year? Also in 2012 tornadoes were relatively rare, as no year saw fewer tornadoes than 2012 since tornado recording began in 1954. It’s worse than it seems. The USA has more and better technology today than it did in the earlier years of tornado recording. The NOAA said that 2012 was the hottest year on the record in the Contiguous USA. Question: why are they getting more frequent ? 7) They are not getting worse ? One might reasonably ask the question why is it alsways assumed that things will get worse under climate change. The link between climate and weather is not always clear so even if the global temperature warms, why do we assume – less rain, more hurricanes, more tornados? Presumably because hot suggests more thermal energy and hot and dry are linked in the minds of climate scientists who live in temperate climes. However, the warmest areas of the planet are the tropics, which of course are home to tropical rainforests, so hot and dry can be uncoupled for a start. There are vast flat spaces in Central Asia and Western Siberia; and yet, reports of tornadoes in these regions are very few, and tornadoes there, if they ever occur, are much less powerful than in the U.S.
roughly border between South Dakota and North Dakota. That’s at approx. 46 degrees latitude. state is rather beyond my understanding. The reason the USA has more tornadoes than the rest of the world is due to the topography of the vertical N/South ridge of the Rocky Mountains causes aerological blocking of the zonal flow when the lunar declinational tidal bulge production at culmination is delayed a day while the warm moist air from the gulf comes up from the South, then the North Western of the tidal bulge is deflected around the Southern end of the Rockies and presents as the commonly seen dry line that sweeps in from the west to over run the slower moving gulf air mass. The timing and the intensity of the tornado outbreaks are a result of the relative declination at culmination as the 18.6 year mn declinational cycle of the moon changes, it reaches its most intense effects when the angle is increasing through the 23.5 degrees angle equal to the summer declinational angle of the sun. At maximum culmination angle ~28.5 degrees there is a lot more turbulence generated into the global circulation, and the tracks move further North. We are currently at ~19.5 degrees at lunar culmination and decreasing, the syzygy of the sun / moon is/will be limited to the mid summer months so we are not seeing as many early spring outbreaks. In Russia the Urals are not as high, nor extend as far South and as a result, out of the normal flow patterns of the tidal bulges that form in that area, partly because of the blocking from the Tibetan Mountains, they see mostly monsoonal flows in that part of the world. One might reasonably ask the question why is it always assumed that things will get worse under climate change. For one thing, if you polled the people living here in Minnesota where I live, plus those living at similar latitudes worldwide, plus those slightly South and North to the SubArctic, and asked if they would gladly accept all the draconian measures the climate alarmists demand as a solution to CAGW, but allow as the only catastrophe there is likely to be is slightly milder winters and slightly longer growing seasons, you probably wouldn’t find many takers. So, Latitude thinks that number counting before Doppler is a problem. Hmmm, I guess we can just throw out all records before the satellite era or even the electronic age in that case as obviously no human could possibly keep accurate records. Seems that’s what they’ve done with their models and that’s why they continue to use data from the warm AMO/PDO cycle to spew forth their garbage. He tries to say that temps have risen .5 over the last 40 years and calls this article ‘cherry-picking numbers’. How about you, Latitude, picking out a time when temps were declining rapidly for several years as the ocean cycle changed and then claiming warming from that point? Apparently you have also ignored the fact that the Earth as a whole has actually cooled the last 10 years as the PDO has flipped and will continue to cool, overall, until the AMO flips. What will you people say then, when the globe is colder than at any point in 65 years? More number cherry picking I’m sure. The American people are becoming wise to the Chicken Little antics of the CCC (climate change charlatans) and once they finally realize how much it’s going to cost them while the money is going to friends of the king himself they will fight it. I know the warmists can’t come to grips with that but it’s the end result of a lie based on lies. I see not everything available being disclosed here. Even though the “whole story” shows global warming not making tornadoes worse, I think the omissions can get called into question. For one thing, the tornado count goes back to before 1970 – it starts at or close to 1950. Choosing an artificial start date just before the 1973 superoutbreak could be questioned as cherrypicking, like saying the world has not warmed since the century-class El Nino of 1997-1998. Also, when including F1/EF1 and F0/EF0 tornadoes, the count has risen rather than fallen. Blame increased detection of smaller tornadoes that used to often be unnoticed. I got the year of the 1970’s superoutbreak wrong – it’s 1974. I was thinking of the year of the dip in the sinusoidal approximation of the periodic component in HadCRUT3 when I said 1973. “That much moisture does not typically come over the Rocky Mountains or from the Arctic. My hypothesis, and it is a hypothesis, is that warm, moist Gulf (of Mexico) Coast air is making it way up to Alberta—and then running into colder air or the mountains and whoosh. As to why Gulf Coast air is getting there, well, I’d suggest due to the Arctic warming and not generating enough cold air to push the warm moist air back where it has been traditionally, far to the south. Moist air coming from the Arctic now… Perhaps, just perhaps, MacCracken could have looked at a satellite animation before belching his hypothesis? He would have seen that on June 17, a strong polar anticyclone 1026hPa was coming down west of the west coast of Canada from Alaska, its eastern edge sending moist Pacific air over Washington and British Columbia. On June 18, the system was along the coast and sending more warm moist air from northern California northward that finally on June 19 met the western edge of the 1022hPa vast but weaker anticyclonic agglutination that was sitting east of the Rockies on the US Midwest. On June 20, a new polar anticyclone 1024hPa came down from the Northwest Territories over the northern portion of the Prairies Provinces. Both systems from the NW and from the W took over the area. The Rocky section over Southern Alberta was located in between these two polar highs, squeezing the moist air at their edge into a narrow band with considerable updraft. Hence huge precipitations. So MacCracken’s hypothesis is wrong and could simply have been disproved by looking at weather satellites. How about that, Herr Director? Not only it was powerful arctic air mobile anticyclones –i.e. cooler air- debunking his warming arctic BS, but the moist air came from the Pacific and not the Gulf of Mexico! If arctic colder air masses pushing vigorously south at the end of June is MacCracken’s idea of a global warming climate change, then glaciations would have been torrid episodes of warming too! MacCracken, do us a favor: stay in your plump little retirement job in Washington and model your CO2 and SO2 own emissions! Qualitatively speaking it seems altogether reasonable to me that a warmer climate will have fewer tornadoes. There are two basic factors involved in the production of tornadoes – cool, dry (more dense) air masses coming out of the Rockies clashing with warm, moist (less dense) air masses coming up from the Gulf of Mexico. One would expect the warm, moist air masses to be more plentiful in a warmer climate, but not the cool, dry air masses. If the air coming out of the Rockies is warmer, this equation changes. There are lots of places in the world where warm, moist air moves across regions without causing tornadoes. Why not? I would assert that it is because they don’t clash with cool, dry, dense air masses. The lift that occurs when the two clash comes from the denser air mass pushing under the less dense air mass. If the density difference between the two masses is lessened, then the lift should also be lessened – and thus the energy creating the tornadoes should be lessened. A corollary: even the ones that do form should tend to be weaker. H/T to Andres Valencia for the NOAA link with the map. I found out that my home state of Illinois with 54 per year has the 6th most average tornadoes (after TX, KS, FL, OK, and NE). But lest any of you might think that Chicago is at risk, that is not really so. The twisters generally happen in the southern and southwestern parts of the state mostly. If we notice a trend there, it is that in the coolest decades there were the most tornadoes. The 1930s had only 2, the 1940s only 3. And in recent years none listed at all since 1997. That current lull is the longest gap in history, the next longest being from 1896 to 1911. Those are very significantly higher numbers in the 1950s through 1970s. As to F4s and F5s, the only F5 since 1900 was in 1990, in a far SW suburb. There were 3 F4s in the 1970s. In over 100 years all the F4s and F5s occurred within 19 years of each other (1972-1990). Still within the cool era, before the Hockey Stick. In climate as I understand it, it is the edges of the climate zones that show the trends clearest, similar to the assertions about the Arctic in the last few years. Chicago is on the edge of the tornado zone, so one might expect it to reflect the tornado forming trends and influences fairly clearly. And the broad brush influence is the climate warming – and the numbers seem to indicate more tornadoes during cooler decades. Correlation doesn’t mean causation, but it is worth thinking about. Vahrernholt and Lüning are making what seem to be correct observations. CLEAN AIR CAUSES MORE HURRICANES.